Типичный извержения стиль: Small explosive (strombolian) eruptions, typically every 20-30 mins. Intermittently, ca. every 2-20 years, minor effusive eruptions (lava flows); on average 2-5 times per year larger explosions. 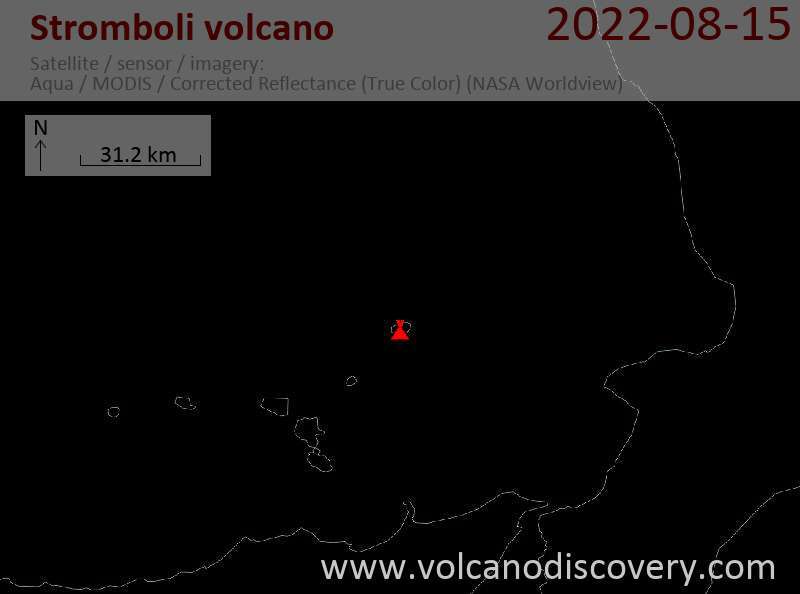 Stromboli Вулкан-извержения: Persistant (near-constant) activity since at least 2-3000 years. Most recent effusive (lava flow) eruptions from Dec. 2002-July 2003, March 2007, Aug-Oct 2014. The N-most island of the Eolian Islands is famous for its spectacular incandescent nighttime explosions, that have long attracted visitors from all over the world and brought the volcano the nickname the "Lighthouse of the Mediterranean." Stromboli has even given its name to this kind of typical small explosions. As long as there are historical records, Stromboli has been constantly active, which makes it almost unique among the volcanoes in the world. Most of its activity consists of brief and small bursts of glowing lava fragments to heights of 100-200 m above the craters. Occasionally, much stronger explosions or periods of more continuous activity can occur. The most violent eruptions during the past 100 years, in 1919, 1930 and on 5 April 2003, were large enough to take lives and or destroy property even at considerable range from the craters, for example inside the inhabited areas. Apart from explosive activity, effusive eruptions with outflow of lava occur at irregular intervals ranging from a few years to decades. The most recent one began on 28 December 2002 and ended in July 2003. Stromboli offers visitors a unique possibility to watch its eruptions. From the rim of an older crater one can stand only 150-250 m almost directly above the active craters,- a perfect viewing terrace. It should be mentioned that this is regarded as surprisingly safe as well: even though there is a small risk of being involved in a sudden, larger explosion (which happen infrequently a few times per year), and then being hit, injured or killed by an ejected bomb from the crater, the risk in terms of numbers is probably much smaller than many other risks in everyday situations. The number of accidents on Stromboli, when compared to the number of visitors at the crater over the years, is extremely small. For hose who know and learn to love it, Stromboli is a magical place,- even not only for its volcano, but also for its unique charm, its beautiful beaches, the lush vegetation and its characteristic and unspoiled architecture.